For simple watering system in the garden needs to get a regular hose and a set of connectors. Today for sale is a large selection of garden hoses in all price categories. The hoses are different diameter and material of manufacture. The most popular option - a hose in diameter of 13 mm. This versatile product can be connected to any crane. Also considerable demand among buyers enjoy the hoses with a diameter of from 18 to 25 mm. Garden hoses are made of plastic, rubber, nylon, PVC. Weight plastic hose is small, but the heavy use it breaks down quickly and accumulates lime. The rubber hose is not terrible temperature changes and extremes. These products have long service life and are reliable and great durability. Hose nylon gibkosti has a good performance, but running too hot or cold water it may be deformed. And, finally, reinforced irrigation hose, PVC has a number of advantages over other hoses. He is not afraid of any strong water pressure or temperature changes. To secure the hose with a tap fitting is used. It is threaded and Threadless. To the fitting the hoses are connected using connectors. 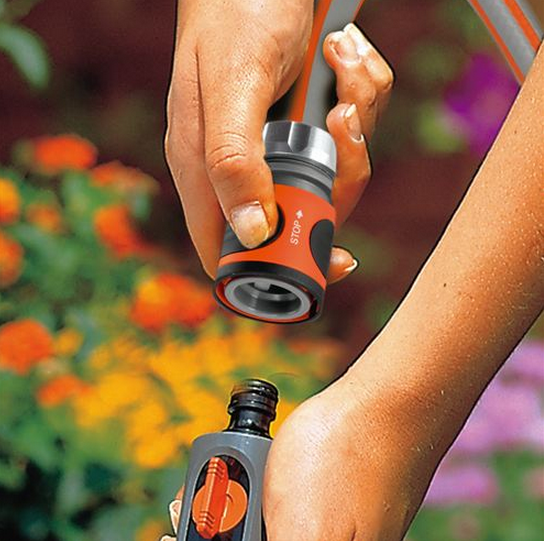 If you need to the hose to attach various bits, then use the connector with AQUASTOP. To repair the damaged section of the hose use a repair coupling. Sometimes you need to increase the hose or to connect the two different diameter hoses. Here comes the adapter. To attach a garden hose to the connector should be as straight as possible to cut off the end. Further strengthen hose nut, the hose is inserted into the connector and evenly tightening the nut. The adapter is used to connect several sections of garden hose. If one tap is needed to connect two or more hoses, will need a multi-channel dispenser. Mainly for hose coupling uses a clamping type end connections by means of 2 elements: bushings and fittings. Fitting insert in the hose and it put on the sleeve. The scheme of connection of the fitting with the hose using the same part more economical. Another type of connection – twisted. When assembling the sleeve screwed into the hose and fitting and install into the grommet and the hose at the same time. If the pipe end has no threads, an adapter or connector with a rubber end. For transportation and storage of hoses used the method of "coil", which prevents from twisting.